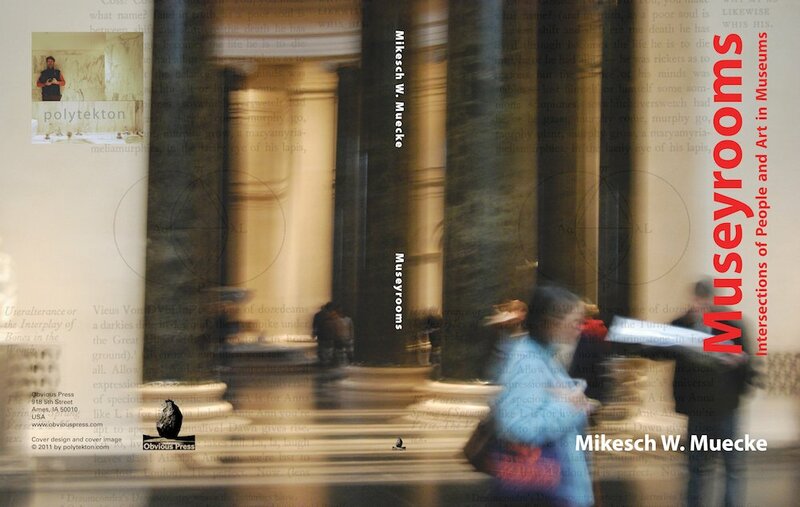 Museyrooms: Intersections of People and Art in Museums is a collection of color photographs taken by polytekton, aka Mikesch Muecke, that document the surprising resonance between animate and inanimate art in museums around the world. In Babel’s Tower Francis Taylor called museums evidence of the “magpiety of mankind.” Over the last years I visited several of these spaces of manic collecting and, where non-flash photography was permitted, I began to take images of the interiors. Soon I noticed that a large number of my photographs were blurred. Before discarding these obviously flawed images I observed—by taking a second look—a certain lightness in these pictures that stood in marked contrast to the rigidity of the physical museum spaces and their contents. The sense of power and control that museal architecture always represents, seemed to have been countered by photographs that captured not only the art but also the museums’ inhabitants in motion. At times I felt compelled to include some non-blurry pictures of the artwork as well but for the most time I was amazed—and detained—by that subtle intersection of architecture, space, and inhabitants in motion. This book contains photographs I took in the following museums: the Art Institute in Chicago, IL, the Musée des Arts et Métiers in Paris, the Louvre, the MARTa in Herford, Germany, the Freilichtmuseum in Detmold, Germany, the National Gallery in Washington, DC, the Building Museum in Washington, DC, the French Icarian Colony Living History Museum in Corning, IA, the St. Louis Art Museum in St. Louis, MO, and finally both the Nelson-Atkins and the Kemper Museum in Kansas City, MO. As Bloomer writes in her essay, Joyce’s words are ‘switching mechanisms’—especially for those of us who know more than one language—and in a different but related sense the images on the following pages work as visual switches between what we expect to see in a museum, and what people actually do in these collective and collecting spaces.